UK retail group Littlewoods will cut up to 3,200 jobs as part of plans to shut 126 of its Index catalogue-based shops. Littlewoods is selling the remaining 33 shops in the Index estate to retail giant GUS, which will convert them into Argos stores, saving 800 jobs. On Tuesday the company revealed which of its total 66 stand-alone stores will be closed and which will be rebranded. 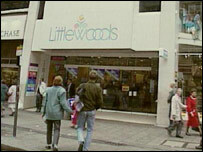 Littlewoods said the Index stores had accumulated losses of more than £100m over two decades of operation. The latest closures follow the demise of Allders and The Gadget Shop, hit by the slowdown in consumer spending. Littlewoods is owned by the Barclay brothers, the twin tycoons who also own the Telegraph newspapers and the Ritz Hotel. Index, its catalogue arm, has seen trade squeezed by Matalan, TK Maxx, and Argos. "We don't have the buying power to compete with Argos," said David Boardman of Littlewoods on Monday. "Index has not made a profit in 18 of its 20 years. That is not sustainable and action had to be taken. It is a very difficult situation that has to be dealt with." Littlewoods said 50% of its 66 stand-alone Index stores would be closed within the next six months. The rest will be sold off to GUS for £44m. A further 93 Index stores located inside Littlewoods outlets will be closed, with the floor space retained by Littlewoods. Index employs a total of 4,000 staff, and about 800 of them will be transferred to Argos, which is owned by GUS. GUS said it planned to convert the 33 sites into Argos stores within three months of finalising the deal. However, the company said at least 350 jobs at its distribution centre in Moxley, West Midlands and 170 posts at its Liverpool head office were likely to go. Union officials said the decision had come completely out of the blue. "Our members who have contributed to the success of this company have been left reeling and utterly shocked by this devastating news," said John Gorle, of shopworkers' union Usdaw. "This is a bolt from the blue, we were aware of the difficult trading position and were expecting an announcement but nothing like this." He said various management plans to turn around the business had not been successful. Usdaw said it would urge Littlewoods to redeploy as many staff as possible into other parts of the group. Now the Index sites are facing closure, speculation is mounting that the Barclay brothers are poised to sell the 119-strong Littlewoods stores chain. Discount clothing retailer Primark has been tipped as a potential bidder. The stores to be sold to Argos and rebranded are at Bangor in Northern Ireland, Barking, Belfast (Castlecourt), Belfast (Connswater), Birmingham, Bromley, Bury, Clydebank, Dumfries, Dundee (Wellgate), Guildford, Huddersfield, Hull, Liverpool (Bold St), Londonderry, Maidstone, Manchester (Hulme), Manchester (The Fort), Newcastle, Newry, Northampton, Norwich, Oldham, Plymouth, Rotherham, Scarborough, Stockport, Telford, Wakefield, Walthamstow, Widnes, Worthing, York. Out of the 126 stores to be shut, the 33 stand-alone sites are at Altrincham, Ballymena, Basildon, Belfast (Ann St), Basingstoke, Boscombe, Cardiff, Bury St Edmunds, Craigavon, East Kilbride, Edgware, Ellesmere Port, Falkirk, Farnborough, Glenrothes, Grimsby, Hartlepool, Horsham, Ilford, Kilmarnock, Merry Hill, Nuneaton, Nottingham, Redhill, Romford, Salisbury, Sheffield, Shrewsbury, Stafford, Thurrock, Walsall, Wigan, Witham.